Step 2: Create a text file with the name ‘FirstCProgram’ save it as ‘FirstCProgram.C’. Make sure that the extension is ‘.C’ and not ‘.txt’. 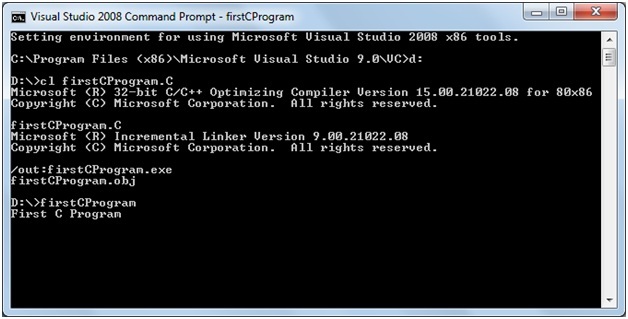 Step 3: Write your C program in ‘FirstCProgram.C’ or you can use the below code and save it. Step 4: Go to the directory (Folder in which you have saved your C Program) from the command prompt. To go to one level back type ‘cd..’ and press ‘Enter’. If you want to change the drive from ‘C:’ to ‘D:’ just type ‘D:’ and press ‘Enter’. Let us suppose you want to go to folder named ‘Programs’ present in ‘D’ and you are in ‘C:’ drive then just type the commands in command prompt as shown in the below screenshot. Step 5:Type the following command to compile your C Program as shown below. On successful compilation following screen will be displayed. 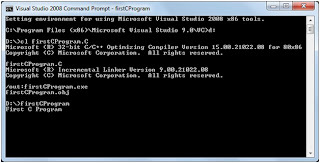 After successful compilation, you can see FirstCProgram.obj file and FirstCProgram.exe file in your folder. You can ignore FirstCProgram.obj file as it is intermediate file. You can safely delete it if you don’t want that file to be in your computer. 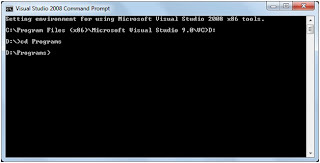 Step 6: To run the program simply type FirstCProgram in your command prompt and press enter or you can directly click the.exe file that got created just after compilation. Thats all folks. I will come up with a new article in another few days. Please provide your valuable comments about this article or anything related to this website. It would really help me in improving the website. Excellent article. Explained each and every steps very accurately. I will definitely refer this site to my friends who are new to C programming. This is the best C tutorial site i ever came across. Thanks for creating such a wonderful website. Excellent article. 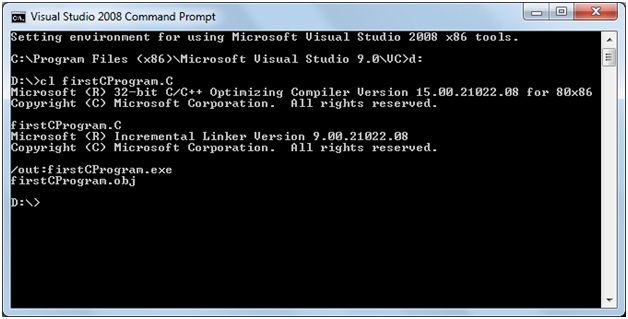 I was really fed with compiling a c program until I found this. Thanks a lot. super article. Can i know how to run collection of c files at a time. i.e. my folder have so many .c files? Till date i have confused myself with c concepts, but after read your blog i would get a clear.hats off to you. I saved the C file in D drive within a folder. How i can run from that place itself?